Money in the Garage: How much for this carpet on my shoulder? 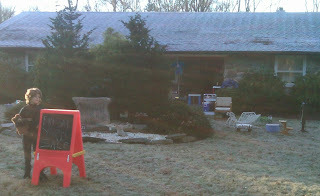 As it get's colder and colder, yesterday may have been the last yard sale of the season for me. (Check out the frost on the roof.) This was hosted by a little old lady who is a bit of an eccentric. That's a child mannequin standing next to the Little Tikes chalkboard, sort of creepy right? I've been to this lady's sales before. A few years ago while looking around, the lady asked me if I would move a couple of rolled up area rugs out to her driveway. I am a pushover for seniors since they always seem to remind me of my grandparents. Naturally I agreed and threw the carpet over my shoulder...dang it was heavy! It's the only time I've ever been asked to perform hard physical labor at a sale! Mrs. Dude was with me at the sale and was very amused that I was put to work. What's worse, after hauling the carpet, I didn't find anything good at the sale...all that heavy lifting for nothing! At this frosty garage sale I was the first person to show up. But since she's had sales before, I figured the likelihood of finding anything good was low. Turns out I was right-nothing of great significance found. I did uncover one of those vintage Fisher Price house boats, but they really have no value by themselves. The money is in the smaller pieces like the chairs, tables and Little People figures. If you research Fisher Price toys on eBay, you'll find big toys without their smaller pieces don't sell well. It's always a good idea to look them up before you buy. So once again I walked down the driveway empty handed. As I left the sale, the little old lady came out of the house with her cup of coffee. I gave her a quick wave before she recognized me and put me back to work! Let me know if you find any late season finds. Also, remember if you're asked to move the seller's stuff...lift with your legs! I found quite a few things at a friend's mom's house today. Lots and lots of plush (which I have no clue what to do with) and some nice clothes. She had left the stuff out over night so it was nice and frosty. If I could've felt my hands, I probably would have looked for more, but I'm interested to see how my foray into stuffed animals goes! I'm pretty sure that's going to be it for us this season, too. Hey Maggie-I hate when they leave stuff out overnight. It can be the kiss of death for some things like paperbacks, the covers will curl from the moisture. Makes you think if they can't bring the stuff in, maybe it's not worth protecting. But good luck with the plush toys, let us know if you make a big score! Dude! How much did she want for the creepy mannequin? It looks vintage. Clamco-You got me thinking about that so guess what I did today? I went back to the little old lady (Ruth) and asked her if she still had it! Turns out she did, so I bought it for $20! It's missing the arms but I still think I can get $75 to $100 to the right buyer. I'll let you know how I do, thanks for calling my attention to it! Isn't it funny how as a buyer you focus on certain things at yard sales and can totally overlook other stuff! I would have asked about the mannequin too! Hope you do well with it. Not long ago I went to a garage sale and picked up a few items with price tags on them, total asking price for all my little things was just $5 but they were worth more than that to me, and as well to sell on. The middle aged lady, (like me, though she was 40's and Im staying 36) mentioned to a pensioner she also had a bbq but it was stuck out the side and her husband had gone out. I offered to help her drag it out - it was quite tricky and hefty, so lucky i had worn my G/saling outfit! Once done, she thanked me profusely and said my things were free. Like I said, at $5 it was no big loss on her part but she hadnt actually seen or totalled it up properly so it could have been 'harder'on her, but a lovely, lovely gesture that I really appreciated, no matter what the cost. I love good things going around!